Is the fall of Idlib the solution for the Syrian crisis? Widespread destruction can be seen after Assad regime bombings in the town of al-Habit, southern Idlib, Sept. 9. Idlib is a province mostly covered with olive trees and is known among Syrians as "Green Idlib." It was the economic backbone of Syria thanks to its olives and olive oil industry. The early Bronze Age ruins of Ebla, a third millennium ancient city; the Menzil Kulliyah with its castle, caravanserai, bath, mosque and primary school built by the Ottoman Grand Vizier Köprülü Mehmed Pasha at Jisr al-Sughur; and a number of well-known mosques, such as Sa'd ibn Waqqas Mosque, the great Abu Dharr al-Ghifari Mosque and the Khalid ibn al-Walid Mosque, all sit in the city of Idlib. Likewise, Syria is home to a UNESCO World Heritage Site, the famous Greco-Roman ruins of Palmyra. Unfortunately, regime warplanes have already bombed Al Gharbi Mosque in Tamanea, a town in the province of Idlib. About 28,000 regime forces backed by the Russian warplanes have laid siege to the province, starting from south of Aleppo up to the Turkish border in the west. Coalition forces as well as the United States, Russia, Iran, Saudi Arabia, Israel and various European countries have yet to fully understand the real situation in Syria, despite their interest in the internal affairs of the country. The U.S. went so far as to back and arm the PKK's Syrian affiliate, the People's Protection Units (YPG), and other terrorist groups; thus, forcing Ankara and Turkey-aligned Syrian opposition groups to carry out Operation Euphrates Shield in al-Bab and Operation Olive Branch in Afrin to secure Turkey's southern border. All of these foreign actors could have been put to better use by preventing and solving the Syrian war either through negotiations or a joint military force to stop the war before it even started. Yet, unfortunately they safeguarded their interests at the expense of innocent Syrians. At this point in the war, every side has nearly reached the point of no return. From here on out, their choices will be limited, partially dependent on guarding their own interests, making withdrawals and peace talks nearly impossible. In the end, if all sides continue at this pace, the war could stretch out for another decade or more. Despite the interests these countries have in the region, they do not justify the human cost required to maintain them. Idlib now hosts 100,000 opposition forces, including militants and terrorists who were chased out of Damascus, Deraa, Hama and Homs. 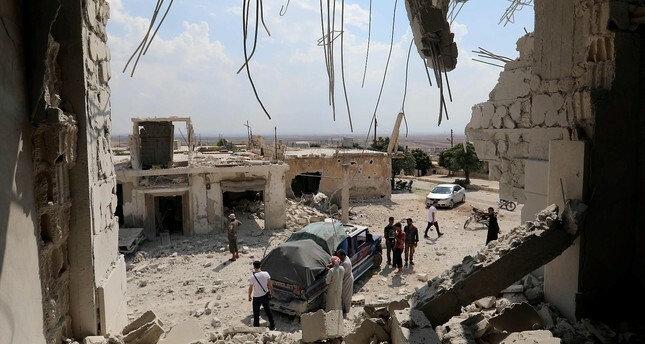 It is virtually impossible for the regime and Russia to distinguish them from innocent civilians; however, a victory in Idlib at the expense of civilians has been put forth as the best options for all the regime-friendly countries involved in the war. According to the regime, rather Bashar Assad, the fall of Idlib will be a victory for a war that has been going on since March 15, 2011, and the neighboring provinces of Aleppo, Hama and Latakia will be safe from possible attacks from both the opposition and militant fighters. Likewise, the Russian Khmeimim Air Base located southeast of Latakia will also be secured from terrorist attacks. For the U.S. and European countries, an opportunity might arise to bomb Assad and his forces in case any chemical weapons are used, particularly against civilians. Is the fall of Idlib the solution for the Syrian crisis? Will it be the end of the war? The answers to these questions are both no. The population of Syria before the war was around 22 million. Nearly half the country is occupied by foreign forces, opposition groups, militants or terrorists. The remaining other half is not free from the influence of foreign powers. Apparently, there is no solution to the Syrian crisis. The war or the conflict might go on another 10 years and even if resolved, it will restart perhaps after 10 or 20 years, as it was the case in Iraq. The only solution to such crises requires that the state reinstates its humane approach to politics and justice while refraining from building its wealth with the blood of innocent civilians.